ORATORIO (AUS) (Bay 2001-Stud 2005). 4 wins-3 at 2, MVRC CS Hayes S., Gr.3. Sire of 306 rnrs, 173 wnrs, 12 SW, inc. Lucky Street (WATC Karrakatta P., Gr.2), Motion Pictures, Clueless Angel, Gold Rocks, Waratah's Secret, Gold Busker, Cadenza, Palace Intruder, Belora, Like an Eagle, Latoria, Trustee Brown, SP Dancing Express, Outlaw Pete, Moet Me, Shades of Rio, Passion Cantata, Cuanzo, Fire Born, Coruscation, Coventry to Rio, Irish Coffee, etc. LUCKY STREET (c. by Oratorio). 4 wins. See below. Secret Enigma (g. by Bletchley Park). 8 wins to 1300m, A$299,830, WATC Marilyn Bergersen 22 Years H., Brooklyn Bridge H., Denise Taviera 26 Years H., Western Suburbs Weekly H., Importune H., Baileys Irish Cream H., Tabtouch.mobi H., Golden River Developments H., 2d WATC EO Norton Memorial H., David Newland 30 Years H., Eastern Standard H., Jones Ballard Property Group H., So Secret Standing at Rangeview Stud H., Perth Racing Members H., Perth Cup Day at Ascot H., Double Dignity H., Petite Amour H., Perthracing.com.au H., Call TAB to Bet H., 3d WATC Top Villain H., Parrys Carpets H., Myer Trophy, Call TAB to Bet 132 369 H., HPM Legrand Electrical Accessories H., Westspeed H.
Catzilla. 5 wins to 1300m to 2014-15, 2d WATC Crown Perth H.
Joyous Express (g. by Danehill Express). 4 wins from 1200m to 1700m, Singapore TC Celebrations S., Korea Racing Authority Trophy, Kranji C S., Class 4 H., 2d Singapore TC Tsim Sha Tsui H., Graduation S., Initiation P., Benchmark 67 H., 3d Singapore TC Class 4 H.
Rumours. 6 wins. See above. Kelldale. 6 wins-1 at 2-from 1000m to 2400m, WATC Ashburton H., South Fremantle H., Asian Beauty H., 2d AJC Elders Real Estate H., STC Riverstone H., Campbellfield H., WATC Shaggy Ridge H., Western Pago H., 3d WATC Wellington H., RAAF 13th Squadron H., Toyota Gimcrack H., Smart Chief H., Galilee H.
GIVEN VISION (Belong to Me). Champion 3YO Miler in Singapore in 2009. 5 wins from 1200m to 1600m, S$835,873, Singapore TC 3YO Challenge (2nd Leg), Sgp-2, 3YO Challenge (3rd Leg), Sgp-2, Class 4 H.-twice, 2d Singapore Gold Cup, Sgp-1, 3d Singapore TC Raffles Cup, Sgp-1. Hostwin Pegasus. 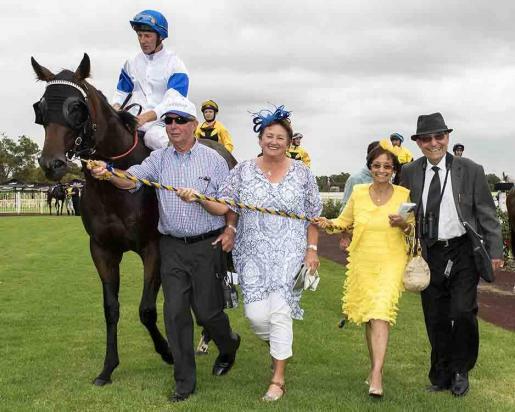 2 wins at 1000m in 2014-15, 2d ATC Adaptra 2YO H.
Sea Knight. 2 wins at 1000m, 1350m, 3d SAJC Hanshin 2YO P.
TSUNAMI (Gunsynd). 11 wins to 1450m, A$92,045, WATC Hyperion S., Gr.3, Australia Day S., L-twice, Coventry Welter H., Foundation Graduation S., Graduation S., Hennessy Graduation S., Prospects Graduation S., Riverview Graduation S., 2d WATC Railway S., Gr.1, Hollister H., Qantas Holidays H., Lamont Graduation S., Breville Sprint H., Chelsea H., Coventry Welter H., 3d VATC Aquanita H., WATC Lions Welter H., Sunspeed S., 4th WATC Birthday Quality S., L.
Castalia (Century). 9 wins-4 at 2-to 1250m, MVRC Niddrie H., Somerton H., Claridge 25's H., VATC Gwyn Nursery, La Trobe H., 2d VRC Maribyrnong Trial S., L, SAJC Wills H., 3d VRC Flemington S., L, MVRC Picaninny H., 4th MVRC St Albans H., L. Sire. Torrid Weather. 6 wins to 1200m, SAJC Ascot Park Cheap Foods H., Wolf Blass Flying H., Zambari H., 2d SAJC Yalumba H., Tab Tavern H., Sizzler P., Fox & Hounds H., 3d SAJC Comic Court Flying H., Flying H., Lane Print Group P., West End Dry H., Kafm Auto Parts Link H., Morphett Arms Hotel H.
Pandora's Treasure. 4 wins from 1450m to 1700m, BATC Novice H. Producer. Race Record: 5 Starts 4-0-0 A$609,950. 4 wins at 2, A$609,950, in 2014-15, WATC Karrakatta P., Gr.2, Magic Millions Perth 2YO Classic, RL, Perth S., L, Seacorp 2YO P.